I know just what you’re thinking – Benny Hester, that’s that high-voiced adult contemporary guy on Christian radio, right? Not being an AC fan I’d passed on this album numerous times til I saw it described in an ad as “folk/psych”. C’mon now – Benny Hester? 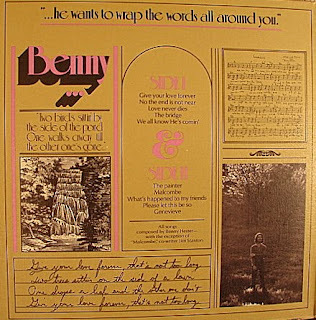 Well, I’m not sure I’d go so far as to utter “folk/psych”, but Benny’s debut release does succeed in capturing a dreamy mood with his melodic brand of orchestrated acoustic rock enhanced by flutes and assorted reed instruments. Not fluff by any means. Does have electric moments and an almost mystical feel perfectly suited to Benny’s Supertrampish vocals. On mainstream label in attractive gate-fold cover. His hair’s real long, too. (Ken Scott – The Archivist). Sorry about the edges these were among the first covers I tried to copy have learned from these mistakes. To be re-released. Check with Benny Hester. Very pleasant … nice soft sound. I really love this album. I own two copies of it, but nether of mine have a gatefold cover that you mentioned. What’s the chance of getting a scan of the inside artwork and the back? 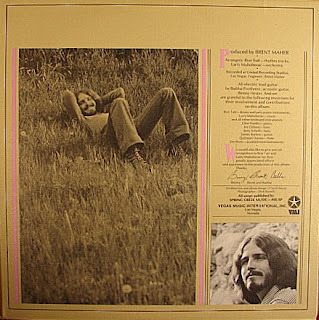 Hi Brother want to thank you for the post of peter scholtes which it is a very beautiful record, and been discovering some really christ underground music from this blog. I could have been listening to the ‘Doobie Brothers’ and not know the difference. It’s really great to hear ‘the music’, and not be drowned in sea of midi effects. Excellent Randy and Peace to you in this new year. Lord give you strength and joy. What a nice suprise to find that I had listened to ‘Benny Hester’ by Benny Hester, and thought it was ‘Benny’ by ‘Benny Hester’. lol. I am looking forward to listen to this one, for if the first that I found was the second, the first has always been the one I enjoy listening to first. Thanks for your diligence and have a great weekend. Peace, KJ. hey guys, i'm sending benny a remaster of the album. he should be selling it soon. Larry Muhoberac, the pianist and co-orchestrator is my dad. I have 4 copies of the album with the original sleeves. Contact Benny once its done and it will include the sleeve inside the CD case. Thank you. I have removed the link to the download. When it is available, please send a link to a site that it can be purchased at and I'll send people your way. Sorry for the delay, I do not have Bernard Backman either of his albums. the Portrait of A Man was 1969 and he had A Portrait of A Woman from 1969 or 1970 also. I am looking for copies. muhoberac here again.. sorry, i didn't mean for you to take the link down… just letting you guys know there's a great quality master coming soon… out of curiosity, where did you get your version? thanks. If I remember correctly I found a still sealed copy and did a rip from it. Sorry for the delay had to find the pics then crop. Finally found them. Sorry for quality as these were in the first group that I took on a borrowed digital camera. I've learned some from the mistakes.Still trying to improve. Hey isn't that the Christian life? Are you aware that the download doesn’t function on this one? Can it be remedied ? So did the re-mastered CD of “Benny” ever emerge per the posts here? But I like this oddball first LP of his the best – it’s kind of like Hester’s “Fool’s Wisdom” compared to Malcom Wild’s rockier offerings when he laid down the acoustic for the Les Paul. Need to dig out the vinyl for a fresh spin off this one! BTW mine has a gatefold cover….now I must have the version with a non-gatefold ! !